Nearly everyone uses their iPhone, iPad, and iPod touch to listen to music, but the experience can be made even better by toggling two simple settings specific to the iOS Music app. The two adjustments we’ll focus on are not enabled by default, but by toggling Sound Check and EQ on, you will find that the mobile music listening experience will sound richer and have significantly less fluctuation in volume levels between songs. You’ll be adjusting two music specific settings in iOS, the end result should be that music playback will sound better. If it’s not immediately obvious what these settings are and how they work, here’s a brief explanation of each. Sound Check: Have you ever noticed how certain audio recordings and songs are much more quiet than some, while others are much louder than the rest? The result is that you’ll constantly be fiddling with the volume levels of the iPhone, iPad, or iPod touch (or the bluetooth / car stereo knobs) as different songs come on, which is kind of annoying. And that is exactly what Sound Check aims to fix. Enabling this setting will automatically adjust the volume levels of songs so that they are all roughly the same level, meaning that classic Hank Williams Sr collection from 1948 is no longer way too quiet when segueing into Eric Clapton or the latest Daft Punk album, which may sound a bit too loud by comparison. EQ: EQ stands for equalizer, which is used to alter the frequencies of audio output. Put simply for music, this means that specific EQ settings may bring out more bass, more treble, higher frequencies, or lower frequencies, which can have a significant effect to how music sounds, and often results in music just plain sounding better. 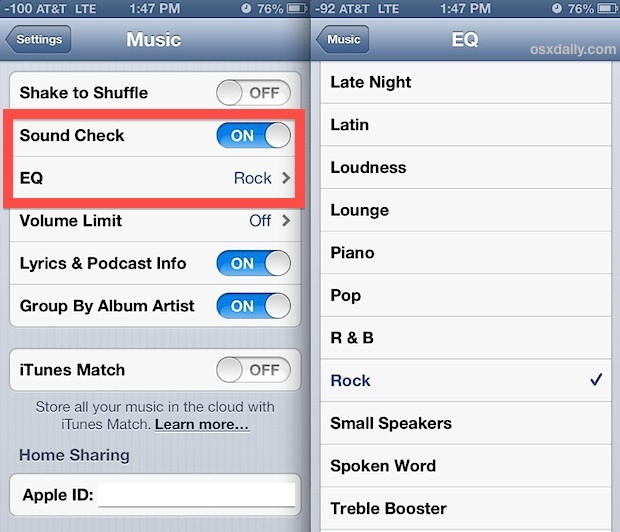 When choosing an EQ setting, it may be helpful to toggle between the Settings screen and a playing song that is somewhere in the middle range of what most of your iOS music collection is. There can be significant changes in amplification, bass, and treble, thus it’s best to pick a fairly moderate song representative of the wider playlists and listen to it live as you test the various settings. Also, you may wish to change the equalizer settings dependent on the actual speakers the iOS device is hooked up to, as an iPod, iPad, or iPhone connected to a tiny speaker dock will sound very different than when connected to a well tuned car stereo. Remember that these two settings will only impact audio that is outputted through the official iOS Music app, and other apps and audio streams will have no difference in how they sound. Don’t forget there are similar features on the desktop side of things available to Mac OS X and Windows users through iTunes, with equalizer settings, soundcheck, and a sound enhancer.